Carlow Association London » The Made in Heaven creator serves up a real Devilish Christmas Feast in South Carlow. The Made in Heaven creator serves up a real Devilish Christmas Feast in South Carlow. A great friend of the Carlow Association London is London born (Harringay) man in South Carlow John Whelan. We asked John about his favourite Christmas dish and what he’ll be cooking for the big day. He sees Christmas as a special time for family and friends. 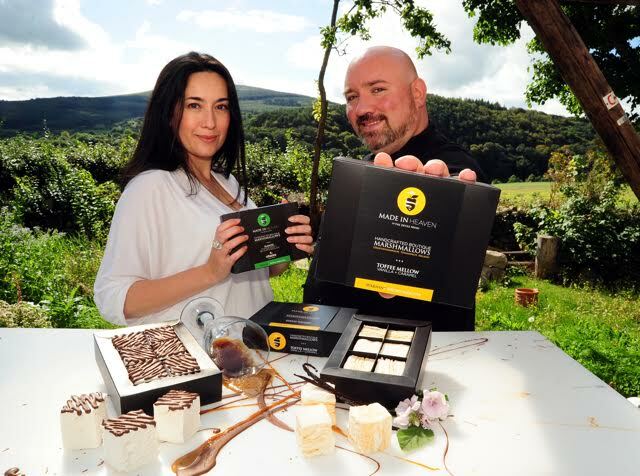 John runs the The Devils Menu in St Mullins Rd in Tinnahinch where he creates the exquisite ‘Made in Heaven’ marshmallows now being sold the world over. He loves cooking saying he ” was born to inspire, teach and share the esoteric magic of food. Join my cult and worship the kitchen!! !” In July 2014 he opened the Boutique Cookery School to friends and guests from home and abroad to celebrate and share his passion for good food and great company. This is what John will be preparing for the guests this Christmas. Here at the Devils Menu Boutique Cookery School we love good local produce and use as much of it as possible in our chef’s table dinners. We are amazingly lucky to be located just outside Tinnahinch with wonderful ingredients on our doorstep. Carlow, Kilkenny and Wexford have an abundance of great vegetables, free range livestock and stunning fish & shellfish. This year we are having a fantastic Christmas dinner that will take a few days preparation but is worth every minute of work. I never expect my guests to cook exactly what I do when they go home, but they all get some great tips that improves their cooking. And to date for the last 16 months we have never had one complaint or less than a 5 star customer review on tripadvisor. My starter this year will be a slow cooked duck egg yolk with a slice of white pudding that I make myself. Served with a lightly pickled onion and freshly baked sourdough baguette. The duck egg is from a farm on Brandon Hill just opposite our kitchen window and it’s cooked in its shell for 1 hour at 63C. The shell and white are then removed and the yolk that still looks raw but is fully cooked is kept warm whilst the pudding is cooked. The white pudding is a secret recipe of mine using free range pork from the Hills of Mount Leinster and takes 3 days to prepare but is delicious. We will be having a Free Range Organic Turkey that comes from about 10 mins away near Mount Loftus bred by our friends Sian & Howard. The turkey will be immersed in a salt and sugar solution brine for 3 days before cooking to give it a better flavour. Dried thoroughly rubbed with butter and then cooked on a high temp 240C for 30 mins and then 180C for 1 hour. Then basted every 10 mins for 45mins. Check the turkey to see if it done by sticking a skewer into the thickest part of the bird and see if the juices run clear. Rest for about 30 – 40 mins lightly covered in foil. I make a stuffing using minced free range pork belly, finely minced organic chicken breast, smoked local bacon finely chopped, finely chopped onion, fresh sage and rosemary from our garden, some of our breadcrumbs, lightly blanched rooster potatoes diced, fresh double cream and seasoned with mace, sea salt, black and white pepper and a touch of nutmeg. This gets all mixed together then rolled in cling film into large sausages. They will be chilled then before lunch poached in lightly boiling water, and then finished in the oven brushed with the juices of the roasting turkey. Gravy made from the reduced juices, a local ale that is reduced in half and redcurrant jelly. Our vegetables will be kept simple and seasonal. Roast & puree of Jerusalem artichoke grown in our garden. Roasted onion mash potato. Confit carrots (grown by my dad) they are just cooked in their own juices and a touch of olive oil. And Brussels sprouts with Serrano ham in a lemon butter. Dessert is going to be a warm chocolate ganache sauce with homemade Madagascan Vanilla ice cream and our luxury marshmallows. To make a delicious ganache sauce warm 250ml of double cream and teaspoon of brown sugar in a pan then add 200g of very good quality milk chocolate drops. Stir until the chocolate has melted and the sauce is rich and shiny. I can’t wait to eat this and lie down in front of a good movie and a roaring fire. Thanks John… And a Happy Christmas to you and all at The Devils Menu.